Definition at line 202 of file btrfs.h. Definition at line 236 of file btrfs.h. Definition at line 214 of file btrfs.h. Referenced by update_backup_superblock(), and write_superblocks(). Definition at line 232 of file btrfs.h. Definition at line 203 of file btrfs.h. 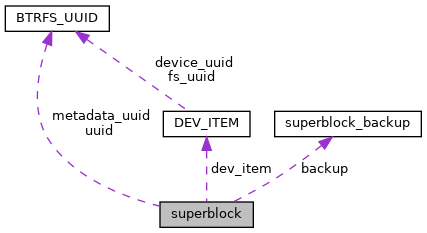 Referenced by if(), is_device_part_of_mounted_btrfs_raid(), is_mounted_multi_device(), read_superblock(), still_has_superblock(), test_vol(), verify_device(), write_superblock(), and write_superblocks(). Definition at line 222 of file btrfs.h. Definition at line 228 of file btrfs.h. Referenced by btrfs_read_chunk_tree(), and update_backup_superblock(). Definition at line 210 of file btrfs.h. Definition at line 223 of file btrfs.h. Definition at line 224 of file btrfs.h. Definition at line 226 of file btrfs.h. Definition at line 230 of file btrfs.h. Referenced by add_volume_device(), find_devices(), is_device_part_of_mounted_btrfs_raid(), is_mounted_multi_device(), write_superblock(), and write_superblocks(). Definition at line 206 of file btrfs.h. Referenced by add_volume_device(), btrfs_read_chunk_tree(), and write_superblocks(). Definition at line 208 of file btrfs.h. Referenced by add_volume_device(), read_superblock(), test_vol(), and write_superblocks(). Definition at line 225 of file btrfs.h. Definition at line 231 of file btrfs.h. Definition at line 219 of file btrfs.h. Definition at line 229 of file btrfs.h. Definition at line 212 of file btrfs.h. Definition at line 211 of file btrfs.h. Definition at line 207 of file btrfs.h. Referenced by is_device_part_of_mounted_btrfs_raid(), is_mounted_multi_device(), read_superblock(), still_has_superblock(), verify_device(), and write_superblocks(). Definition at line 221 of file btrfs.h. Definition at line 218 of file btrfs.h. Referenced by read_superblock(), try_tree_amalgamate(), and write_superblocks(). Definition at line 216 of file btrfs.h. Referenced by add_volume_device(), btrfs_read_chunk_tree(), update_backup_superblock(), verify_volume(), and write_superblocks(). Definition at line 234 of file btrfs.h. Definition at line 237 of file btrfs.h. Definition at line 215 of file btrfs.h. Definition at line 227 of file btrfs.h. Definition at line 209 of file btrfs.h. Definition at line 205 of file btrfs.h. Referenced by write_superblock(), and write_superblocks(). Definition at line 217 of file btrfs.h. Referenced by add_volume_device(), flush_partial_stripe(), read_superblock(), scrub_chunk(), scrub_chunk_raid56(), and write_superblocks(). Definition at line 220 of file btrfs.h. Definition at line 235 of file btrfs.h. Referenced by btrfs_read_sys_chunk_array(), and write_superblocks(). Definition at line 213 of file btrfs.h. Definition at line 204 of file btrfs.h. Referenced by add_volume_device(), find_devices(), is_device_part_of_mounted_btrfs_raid(), is_mounted_multi_device(), read_superblock(), still_has_superblock(), test_vol(), verify_device(), write_superblock(), and write_superblocks(). Definition at line 233 of file btrfs.h.